To say that I was hyped about finally seeing a John 5 solo performance would be a massive understatement. I have seen him countless times playing alongside both Rob Zombie as well as Marilyn Manson. But in both of those scenarios the ability to see his true skills and potential are limited. Sure, you got a guitar solo here and some improvisation there but for the most part the performances were very structured. Now after seeing John be able to really cut loose and showcase his many styles of playing and talents, I can say we’ve all been missing out. Much like his solo albums, the live show hit on his many techniques. We got everything from bluegrass to straight shredding metal, finger picking to power chords. He even played a handful of different guitars along the journey, this was probably the only real-time you’ll hear a predominantly “metal” based crowd scream and cheer for the appearance of a banjo! But regardless of style of axe of choice, the entire crowd had the same reaction, to watch in awe and amazement as he made even his most complex compositions look effortless. 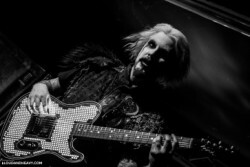 Now unlike his stage times spent with Zombie or Manson which rely heavily on the theatrical elements with the pyrotechnics and lights shows, John 5’s stage show was scaled back and stripped down to its most basic elements. Sure there was a dancing Frankenstein at one point but overall the focus point was simple, let John and guitar be the show. And what a show we were given, his setlist was career spanning covering everything from his newer jams like This is my Rifle and the Portrait of Sidney Sloan to the older ones such a Feisty Cadavers and Behind the Nut Love, even throwing in his cover of Michael Jackson’s Beat It and closing the night out on a musical medley serving as a journey through some of the most recognizable guitar riffs of all time. As the night came to a close we all looked at each other in pure amazement and almost a state of shock as to the show we just saw performed in front of us. I for one have never walked away from a show with such a feeling, this was a one of a kind show and I feel privileged to have been able to witness it. I would most certainly recommend a John 5 solo show to anyone and everyone again and again. So, if you get the chance to see John in a solo setting definitely do everything you can to ensure you can go see it! View our full John 5 gallery over on our Facebook page!